Discontinued Item. Only certain sizes available. 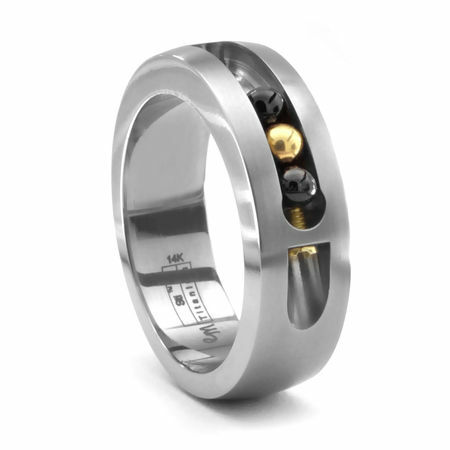 Get a dynamic look for your wedding band by choosing this unique men's titanium ring by Edward Mirell. The stunning design is noteworthy for its stunning moving accents. One 14K gold beads and two round black onyx beads are inset into a groove along the center of the band, allowing them to move as the ring rotates. 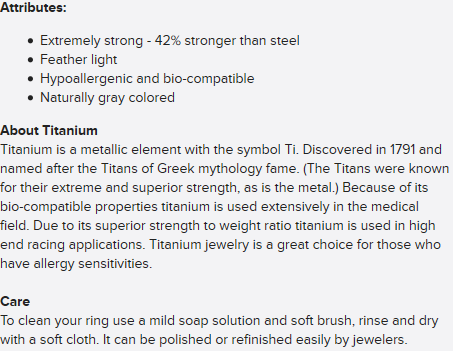 This trend-setting style is made even more stylish since it is comprised of grey titanium that has been polished to a stunning shine. Choose this 7 mm band if you want a wedding ring that never looks the same twice. You'll be fascinated by the way the beads move as you do. This dynamic band is designed by Edward Mirell, a trendsetter in men's ring styles. well i finally got the ring in the mail and wore it > 24 hrs and one of the beads fell out. not to mention that the screw holding the beads in was not up to par, it was very thin and less then impressive. the threads on the inside of the chamber were all mangeld and silver not gold and perfect like in the pic. :( i then called and was just told to send it back and they would send a new one with barely a sorry for your trouble. it say's on this web page . "top notch customer service" B.S. it is a lye. i called three times they were sending shipping lable to my e-mail and about 45 min had gone bye and no e-mail. so then i maid third call and all the person on the phone could tell me was " all i can tell you is it will be sent out SOME TIME today." REALLY how hard is it to send an e-mail so i could at least get it back to the UPS store today before they close! this is going to be my wedding ring and i have to ware this the rest of my life but can tell you i am scared because if it can't even last 24 hrs then will it last a life time. i will not spend a lifetime PAYING and sending this ring to get fixed. i will cut my lose and tell every person i see that they should just go through a local store for there jewelry. it will save them the stress i have and they can just walk in there stuff and get better product and customer service. i have yet to see if there will be any comp. for any of the actions or pure quality ring and customer service i got. as far as the next line would i recommend this to a friend i don't know yet? There is nothing that is not good with this, it is durable, comfortable and definitely catches the eye. It cleans up well (should you get dirt or something else in it). I would recommend the matching pendant too.